Law firm accountants and bookkeepers: We listened! Rocket Matter, the legal software company that brought the industry its first cloud-based practice management platform, today announces the launch of a year-long initiative to dramatically boost their users’ profitability. To kick things off, Rocket Matter is releasing a pair of powerful new integrations aimed at boosting law firm revenue generation, collections, and financial accountability. The first major change allows Rocket Matter users to synchronize their legal time and billing data with QuickBooks Online. Intuit does not claim to be sunsetting the desktop version of QuickBooks, however they are eliminating support services in an effort to encourage small firms to move to the online version. As Intuit changes its strategic focus to the cloud, they are eliminating communication channels (APIs) to their desktop product that companies like Rocket Matter rely on for synchronization. In order to proactively assist law firms with the transition to QuickBooks Online, Rocket Matter is introducing a robust, full-featured integration that continues in the company's tradition of easy-to-use, visually appealing software. Rocket Matter users will be able to tie together detailed information between the two systems, including invoices, expenses, trust account credits and debits, as well as sync all current clients with Rocket Matter. 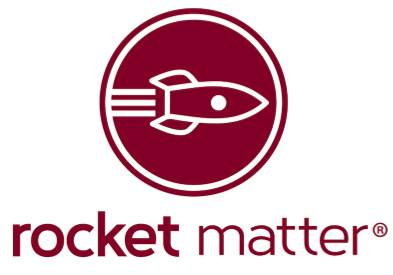 In an effort to help small law firms collect payments for their invoices, Rocket Matter is announcing Rocket Matter Payments. Rocket Matter Payments is a fully integrated payment processing service that allows law firms to simplify and automate the process of sending invoices to their clients and collecting payments. With a smooth invoicing and collections process, Rocket Matter seeks to correct poor billing habits of small law firms and increase their revenue by 50%. With the click of a mouse, Rocket Matter generates an invoice, sends it to a client via email, and includes a link to a payment page. Clients can pay their invoices quickly, easily, and securely, by credit card or directly through their bank. Any payment a client makes is automatically recorded in the Rocket Matter ledgers – and then seamlessly integrated with QuickBooks Online, if desired. In addition, firms will save considerably on processing fees and enhance their overall transactional capabilities. Rocket Matter has secured a deep relationship with payment processor TouchSuite™ which offers the most competitive rates and a very simple onboarding process. Existing Rocket Matter users should note that the company will continue to service the existing QuickBooks desktop integration until Intuit sunsets their communication mechanisms on March 1. Rocket Matter product experts are available to discuss the transition and answer questions at 888-987-6041. Rocket Matter, LLC (URL: http://www.rocketmatter.com) helps law firms grow profits and serve clients through legal software and educational content. The company’s flagship product, Rocket Matter®, is the leading legal practice management and time and billing platform in the cloud. The system helps law firms organize their matters and increase their billing efficiency. Rocket Matter Intake automates new client relationships. Launched in February 2008, Rocket Matter’s corporate headquarters is in Boca Raton, FL.